What is a California Living Will? California Living Will: What Is It? A California living will is more commonly known as an advanced healthcare directive. 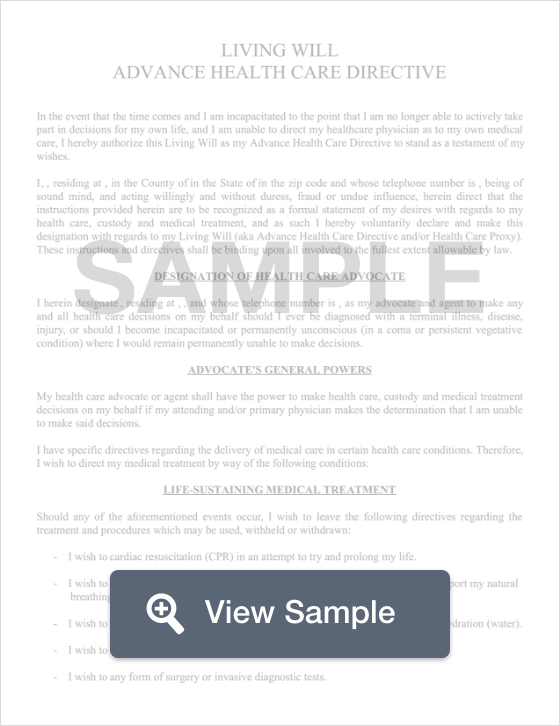 This legal document explains how you want your medical affairs handled if you are no longer able to make your own decisions. You can use a California living will to name someone to make your decisions for you, but California state law places limits on who you can choose. You may not choose your medical provider, an employee of the healthcare facility (unless they are your registered domestic partner or related to you by blood, marriage, or adoption), an operator or an employee of a community care facility (unless they are your registered domestic partner or related to you by blood, marriage, or adoption), or an operator or employee of a residential care facility (unless they are your registered partner or related to you by blood marriage, or adoption). You must sign a California living will and have it signed by two witnesses. At least one of your witnesses cannot be related to you and they cannot be entitled to any part of your estate. If you are in a skilled nursing facility, a California living will must also be witnessed by a patient advocate. § 4600 through § 4736: California living wills may name both an agent and an alternate agent. Although a California living will is written by an adult with the legal capacity to understand the document, the purpose of it is to be used when the person no longer has capacity to make their own healthcare decisions. Another important document to help express your wishes is a California Last Will and Testament.